Sometimes when I walk around the pond called Herrenteich in Reinfeld, I see Gray Herons, it’s just not easy to take photos of them. The large pond is divided by a footbridge, and it separates the pond in two areas. So, one pond side is a natural reserve and walkers can only view it from the bridge and a couple of other spots, but overall the area is well shielded by plants and trees, and this is intentional so that the animals and nature is protected there. The photo in this post is shot from one of the few spots where you have a view, it’s not allowed to enter this area. The pond area on the other side is more accessible, there are paths around and close to that part of the pond, and there are less rules than on the protected side. You can find birds on both sides, but the gray herons live on the protected side of the pond, which is one of the many reasons why this area is protected and regulated. To be honest, I like the concept of nature conservation, it makes sense to me, however the rules should count for everyone. One day I hiked around the protected area, and as said, there are just a few spots where you have a view on the wildlife of the protected pond as pedestrians, but then I saw that they build some villas behind the protected area, and this made me angry. This is what modern capitalism is to me, we protect a piece of nature, but if you have enough money, you can build your villa close to the protected nature to be one of the few who live very close to it, while all others see a sign with a dozen of rules that say you shouldn’t get close to the pond. This basically shows what kind of disease our government is (including the responsible authorities), it shows that they are jus hypocritical and nothing more. Anyway, I don’t want to get too political with this post (at times I just get a bit revolutionary), let me talk about the photo again. I mentioned one of the difficulties to take photos of the gray herons there, there are not many spots where you have a perfect view, and if so, there will be a distance between you and the bird. The other difficulty is that gray herons don’t give you a lot of time, even if you get 20 meter close to them, I noticed they will fly away soon. Anyway, in this post you see a photo where I got a chance, the result is not perfect, but I am happy that I could take a picture of a grey heron. I shot more photos of grey herons over the last months, but I shot some of them in Bad Oldesloe and will upload them too some day. In this case I had to crop the image again, because I was too far away even at 300mm, so, the quality of the image is not so good. The bird is not sharp, the branches in front of me made focussing difficult, but I wanted to use the photo anyway, but I hope I get a better chance again some day. I agree with you about the villas Dennis, that would make me angry too. I don’t like when there is one rule for the rich and another for everyone else. It would be good if whoever is responsible for the nature area would provide a hide for birdwatchers and photographers to observe the wildlife more closely without disturbing them. Yes, this is one of the many examples where our politicians are hypocrites. It looks as if they don’t want to protect nature, but they want to create places for the more wealthy people. 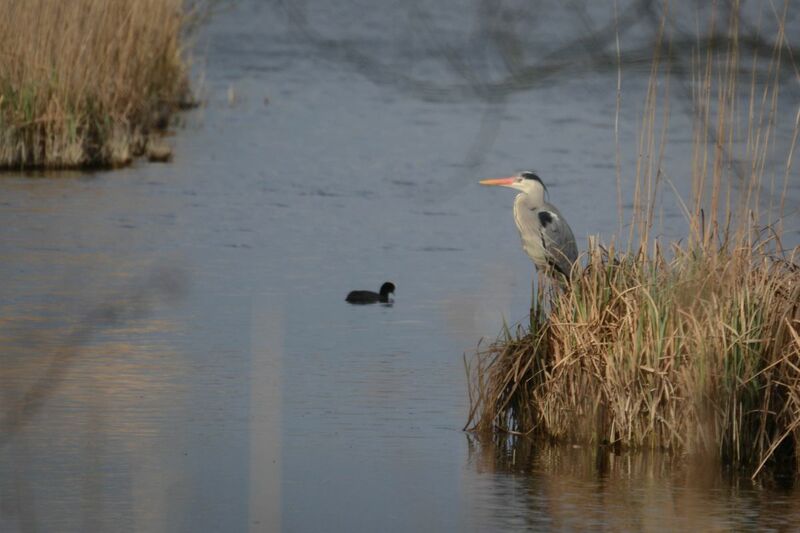 There are a couple of hides for birdwatchers, the spot where I took the photo is one of them, but the view is still bad but I do often see gray herons there. I was often there to see if I could take a better photo.